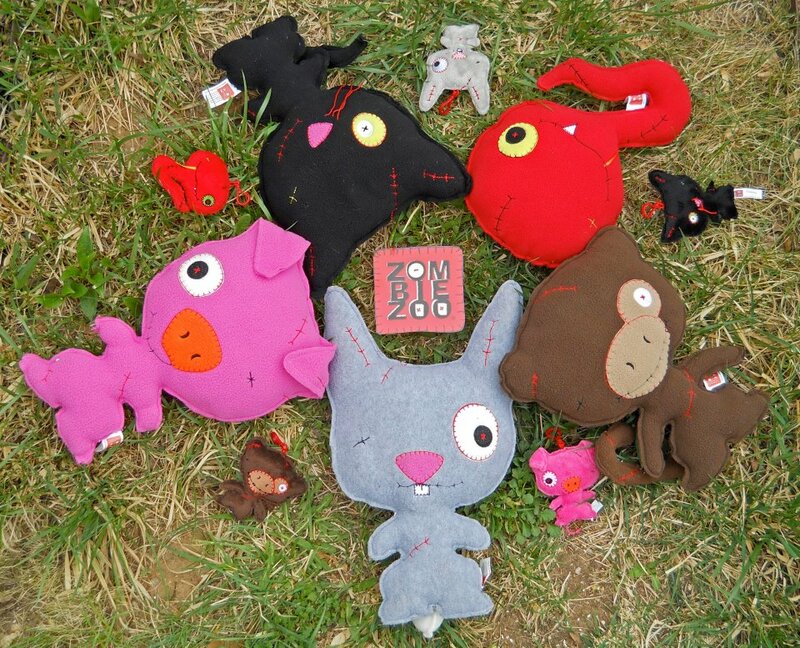 Zombies And Toys: Meet the ZombieZoo! The animals in the ZombieZoo are undead, but still kind and cuddly. In this group of friends, you will find five unique characters: Boo, the black cat, leads the group and is always seeking knowledge either through exploring or reading; Stich is a neat-freak pig, who can’t spend enough time washing and scrubbing; Rob the rabbit is multifaceted--his likes range from poetry to heavy metal; Muck is a popcorn and party loving monkey; Toxic the snake is always trying to win at everything, and thinks she is the coolest. All of these animals are friendly, but edgy at the same time. You can find these great creatures in the Zombie Zoo. In addition to getting to know them better, you can watch a short movie that features them all. You can find out more about the zookeeper, Neecy Twinem, who dreamed up these animals; or, pick up a pal or two of your own--the zootique features full-size plush, clip on minis, and artwork featuring the zoo crew. I had the chance to ask a few questions of Neecy, in order to find out a bit more about her artwork and inspiration for the ZombieZoo. First of all, tell me a bit about your own Boo. Do you really have a black cat, and how is s/he like the ZombieZoo Boo? I do have a cat named Boo. Boo is a big inspiration in my artwork both my fine art and my illustration. He is my muse and continually giving me ideas. I am pretty sure he is the one that whispered the words... "zombiezoo" in my ear. I see that you have may other accomplishments, including children's books, art, and as a speaker. What are some of your favorite subjects in your books and other artwork? My favorite subjects are animals. Animals play a big role in my life and they are so wonderful to create. I like to bring humor and whimsy into my artwork and my kids books. My ZombieZoo characters bear inspiration from the celebration of Dia de los Murtos, Mexican and American Folk Art as well as artists such as Tim Burton and Jim Henson. With making them animals, I got to roll all my favorite things into one! What was the process like to go from illustrations to plush? There was only a slight difference, as both take sketching and planning. Character sketches came first, which is the same for illustration. For the patterns, I had to draw upon my previous skills in sewing. I have sewn forever and created simple patterns as well. Then it was trial and error from there. A very fun experience to see my characters form in plush! What made you want to create zombie animals? Zombie animals are fun! I knew I did not want my zombies to be bloody or gory but I did want them fun and edgy and a bit dark. Kids love monsters and I wanted to create lovable monsters and animals convey that. Do you have a favorite zombie book? Movie? I like the comic by Roman Dirge, Lenore (not your typical zombie book). I love ZombieLand and of course I am a Walking Dead fan. In the event of a zombie apocalypse, if you were bitten, should we shoot you or let you turn, and why? Shoot me. I don't want any to see me eat flesh or anything like that. Although I am sure I would not remember, but I would still want someone to have the guts to "put me down"
Lastly, is there anything else you would like to share with us? Behind the meaning of ZombieZoo, my zombies are not the result of a virus, which is just a modern trend, really. My zombies are more the traditional voodoo zombies. There is lots of blood and gore out there for kids, I wanted to provide some lovable zombies and ZombieZoo was it. There are more characters to come and I am working with a licensing agent on the development for a compelling consumer product range to launch soon. 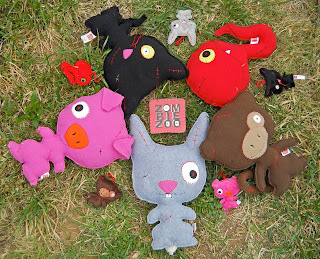 If you are interested in finding out more about these cute ZombieZoo creatures, make sure you stop on over to www.zombie-zoo.com. You can also check out their Facebook Page, or Twitter to keep up with Neecy and her gang. Courtesy of Neecy, we have a set of all five ZombieZoo Minis to give away! Entering is easy, just send us your name and address to: zombiezoo@zombiesandtoys.com. One lucky winner will be chosen on Monday, June 4th. If you can’t wait to make one of these zombies your friend, Neecy has a special code just for Zombies & Toys readers! Enter the code ZZ15-12 at checkout at the Zootique to save 15% off your order. This code is only valid through June 12, 2012, so don't wait.